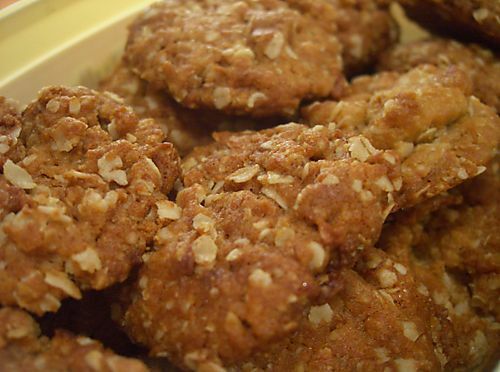 There is a story connected to how Anzac Biscuits were created. During World War 1, the wives, mothers and girlfriends of the Australian soldiers were concerned for the nutritional value of the food being supplied to their men - but any food sent was carried in the ships of the Merchant Navy - lucky to reach speeds of 18.5kms/hr. As most had no refrigeration available, any food sent had to be able to last in excess of two months without spoiling. A body of women came up with the answer - a biscuit with all the nutritional value possible. The basis was a Scottish recipe using rolled oats. At first the biscuits were called "Soldiers’ Biscuits", but after the landing at Gallipoli, they were renamed. Eggs were scarce during the War, as most of the poultry farmers had joined the War effort: therefore, the binding agent for the biscuits was either golden syrup or treacle. Preheat over to 160°C. Grease oven trays, line with baking paper. Combine oats, sifted flour, sugar and coconut in large bowl. Combine butter, syrup and the water in small suacepan, stir over low heat until smooth. Stir in soda. Roll level tablespoons of mixture into balls and place about 5cm apart on trays, and flatten slightly. Bake for about 20 minutes, and let cool on trays. (*Note - Anzac - "Australian and New Zealand Army Corps".